Adventure lies in each puff of cloud, and a seaplane transfer to Nanuya Island Resort with Turtle Airways will excite your imagination and make for an electric start to your holiday. Like your aircraft, Nanuya’s traditional Fijian treetop bures seem to reach for the skies. These rooms offer world class views cross gently swaying trees down to the inviting lagoon below, (you are surprisingly close to the beach here). Or, for the best possible panoramic (270°) views of the blue lagoon, try the Vale Ni Tadra, a luxury villa with its own private gardens and entrance – perfect for a couple’s escape. Luxury need not come at an environmental cost however, and Nanuya Resort utilises solar panels for power. A highlight of your stay might be a sublime sunset cruise, taking in an incredible vista, a resplendent natural light show, or having tremendous fun learning about Fijian culture such as Kokoda (fish salad), Magiti (feast), and Meke (traditional dance). A hot tip for Nanuya Island Resort guests: check out their wonderful boathouse for casual dining, chilled brews and, of course, fun activities on the water. Guests searching for a base to explore the famous Blue Lagoon in the northern Yasawas need look no further than Nanuya Island Resort, perfectly located on the sunset side of the gorgeous Nanuya Lailai Island. The Nanuya Lailai Lagoon Day Spa seems like it must be heaven-sent to many a tired and stressed-out visitor. Tripadvisor guest reviews can’t speak highly enough of the fabulous relaxing massage treatment, and also recommend the yoga classes. Keep the relaxation flowing by finishing your day with a matchless sunset cruise. Watch colour and light dance over the water amongst the Yasawa islands while you enjoy appetizers and drinks. Make sure your visit includes at least one Friday, when guests are treated to Fijian culture and traditions such as making kokoda (ceviche), basket weaving, traditional song and dance (meke) and a hearty feast (magiti). Guests love the festive fun to be had on Fridays – it’s an opportunity to experience authentic village culture without even leaving the resort! 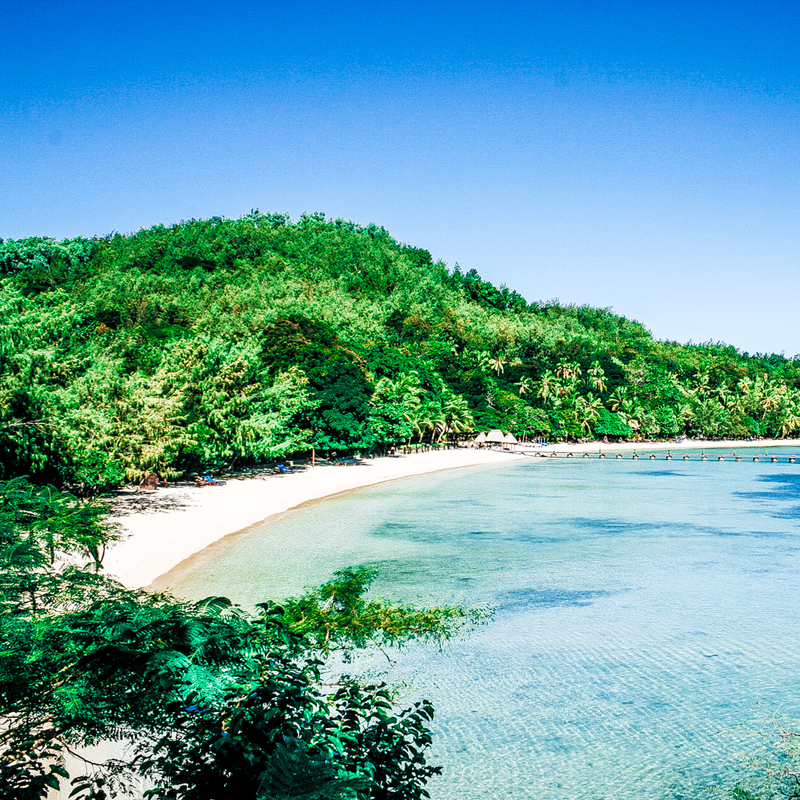 As is always the way in the Yasawas, fantastic snorkelling can be had straight off the resort beach, but plenty of other fun water activities are available too including paddle boarding, kayaking, and fishing. Couples looking for a wedding venue will be excited by the professionally-arranged authentic beach ceremonies on offer. Romance and love are always in the air as the sun sets over another perfect wedding day in the Yasawas. 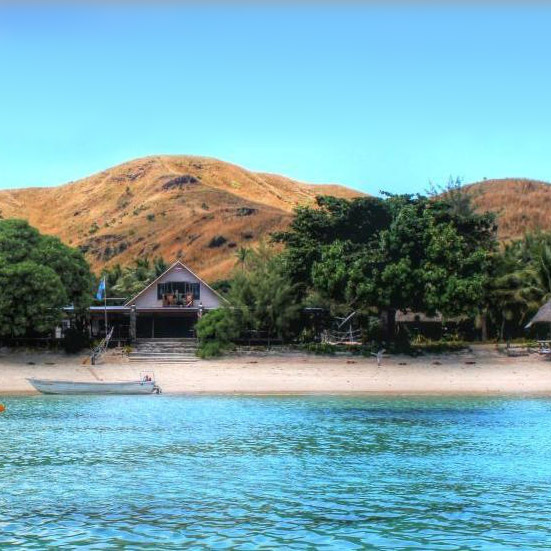 Nanuya Island Resort Fiji also runs the Boathouse, for casual dining and a relaxed social atmosphere. Boathouse Nanuya also provides a convenience store, cable TV, high-speed internet, and day tour booking facilities. Backpackers on a budget will enjoy the opportunity to chill out and swap stories with other travellers. The Traditional Tree Top Bures, despite being set back from the beach among the trees on the hillside, are regarded time and time again in Tripadvisor reviews as the preferable room choice at Nanuya Resort due to unequaled views, excellent privacy, and cool breezes. Relax in a Deluxe Villa, nestled amongst the coconut trees and only a short distance from the beachfront (suitable for couples and families alike), or enjoy the spaciousness and luxury of the Superior Villa’s private courtyard that includes a spa bath, sun lounger, and outdoor raintree shower. Truly special occasions such as honeymoons and anniversaries deserve to be celebrated in style in the Vale Ni Tadra (House of Dreams) Luxury Villa. Stunning 270 degree views over the Blue Lagoon and unrivalled privacy will leave guests feeling like royalty. Each bure is fan cooled with its own private bathroom, safe, mini bar and tea and coffee making facilities. Also worth mentioning is the rule that children under seven years old are not able to stay at Nanuya Island Resort. For travellers on a slightly stricter budget, the Boathouse offers Dormitory, Double Room, and Triple Room accommodation. These options are perfect for guests prioritising paid island activities on their trip and merely needing a simple but comfortable place to rest their heads in the evening. As mentioned, the resort does not cater to children under seven but wonderful family holidays with older children who have outgrown needing the entertainment of kids’ clubs are still certainly possible. Nanuya Island Resort is designed for visitors who are ready and will to truly embrace the Fijian island lifestyle. Friendly staff are always at hand to help guide guests into the most relaxing state of being they have ever experienced. 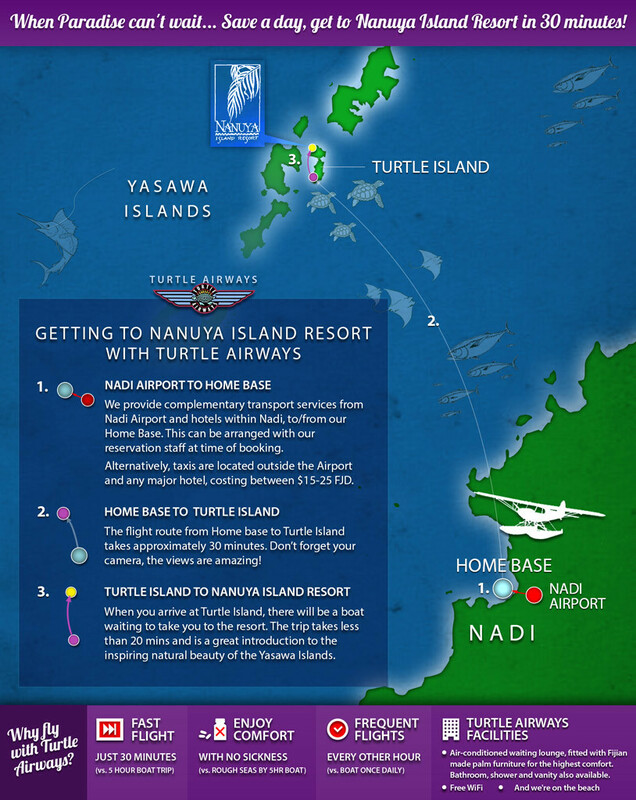 A Turtle Airways seaplane transfer to Nanuya Island Resort is the ultimate way to leave Nadi and enter the Yasawas. You will land at Turtle Island (the same island used in the filming of Brooke Shield’s The Blue Lagoon ) and from there be taken by boat through perfect blue waters to Nanuya Island Resort, a lively trip of no more than 15 to 20 minutes.